What is “Bladeless” or “All Laser” Custom LASIK? This state-of-the-art procedure is our preferred technique of laser vision correction for the majority of patients. Two lasers are used to perform Bladeless LASIK. It reduces the inherent risks associated with a blade passing through the surface of the eye. The precisely produced flap is thinner and allows for greater corneal stability and the treatment of higher levels of correction. The second laser is the Excimer Laser which reshapes the cornea to correct the refractive error (glasses / contact lenses prescription). Drs. Altman, Primack, and Shah are the only refractive surgeons in Berks County to perform Bladeless LASIK on site in the convenience of their fully-licensed outpatient surgical facility. 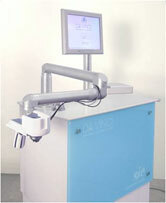 The Ziemer Femtosecond Laser (below) represents the most advanced LASIK Flap technology available today.